Together with their colleagues, Masaru Nakano at the Research and Development Center for Earthquake and Tsunami and Daisuke Sugiyama at the Center for Earth Information Science and Technology, both of the Japan Agency for Marine-Earth Science and Technology (JAMSTEC), have developed a new method of detecting seismic motions. 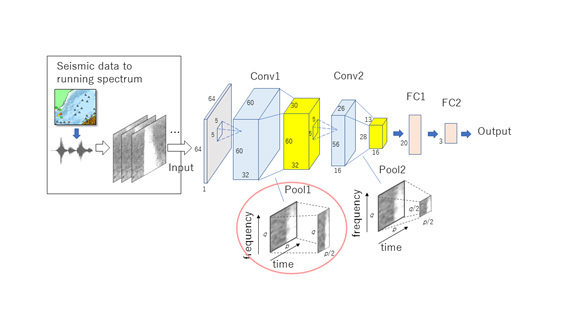 This method, called the Seismic Running-Spectra Convolutional Neural Network, or “SRSpec-CNN,” uses the running spectra (*1) from seismograms to automatically and accurately discriminate between signals from low-frequency tremors (*2; Fig. 1) and regular earthquakes through the application of artificial intelligence (AI) technologies. Low-frequency tremors are a form of slow earthquakes (*3) that are generated along and/or close to plate boundary faults. Conventional methods of detecting low-frequency tremors also detect regular earthquake signals. Therefore, the results must be checked visually or through other means on a case-by-case basis to remove signals other than those from low-frequency tremors. 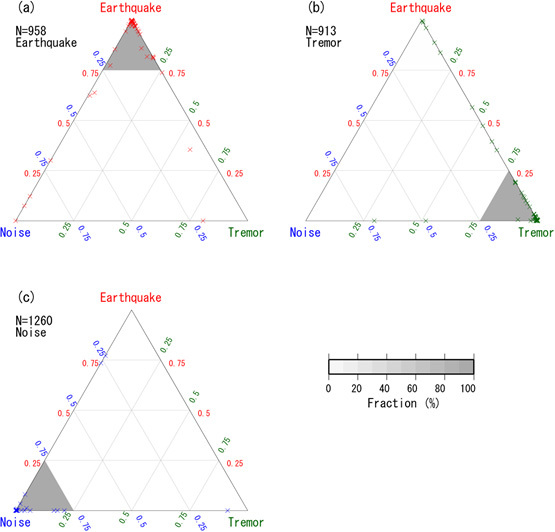 In this study, the researchers focused on the differences in the duration and frequency components between the signals of low-frequency tremors and regular earthquakes. 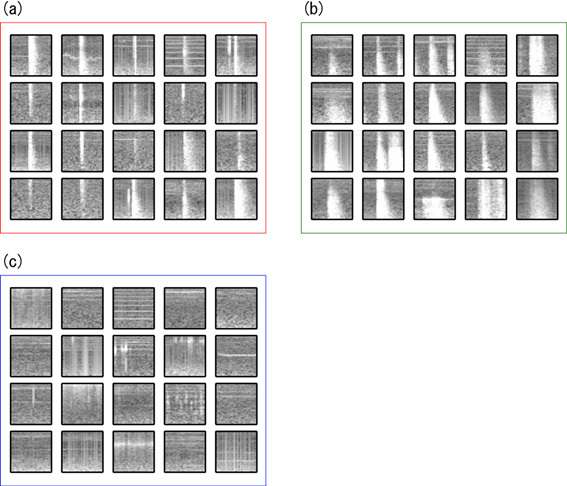 Running spectral images created from seismic motion waveforms are used as input in SRSpec-CNN (Figs. 2 and 3), which then detects the relevant differences in the frequency components that express the physical processes underlying the seismic phenomena. The development of SRSpec-CNN has succeeded not only in automatically distinguishing between the signals of low-frequency tremors and regular earthquakes, but has also improved the accuracy of such discriminations (Fig. 4). SRSpec-CNN was used to differentiate between signals from low-frequency tremors and regular earthquakes recorded via seismographs of the Dense Oceanfloor Network System for Earthquakes and Tsunamis (DONET) observation system (*4; Fig. 5), deployed along the Nankai Trough. The results demonstrated a remarkably high accuracy of 99.5%. 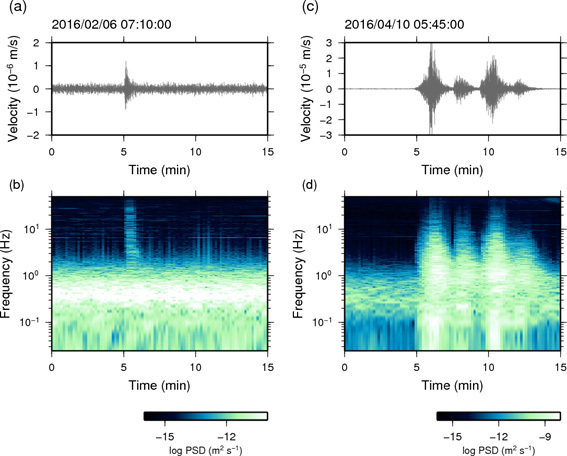 Research has previously been conducted to differentiate between the signals from seismic motions using AI technology, but in almost all cases, direct waveform data were used. This study is the first to use running spectra to differentiate between the signals of seismic motions. Furthermore, detecting differences in signal frequency components using this newly developed method has proven successful in differentiating between seismic motion signals with high accuracy. The generation of slow earthquakes is thought to be deeply connected to strain accumulation mechanisms that lead to the production of major earthquakes at plate boundaries. By automatically monitoring low-frequency tremors using this method, it is expected to facilitate a deeper understanding of the variety of and temporal changes in plate boundary slips, the mechanisms that generate major earthquakes, and preparation processes. These results were published in the online version of Seismological Research Letters issued by the Seismological Society of America on January 3, 2019 (JST). *1: Running spectra: A method of representing the frequency components in signals for wave motions, such as earthquakes, as well as the changes they experience over time. The frequency components are measured on the vertical axis of an image, while their change over time can be followed along the horizontal axis. In this way, this method provides a visual representation of the duration and evolution of the frequency components of the signal. Figures 1b and 1d show the running spectra of the waveforms in Figures 1a and 1c. *2: Low-frequency tremors: Seismic phenomena observed as waveforms whose P-wave and S-wave components, unlike in standard earthquakes, cannot be distinctly observed as arriving separately. The transmitted seismic waveforms feature prominent low-frequency components (single-digit Hz to 10 Hz), when compared to regular earthquakes. 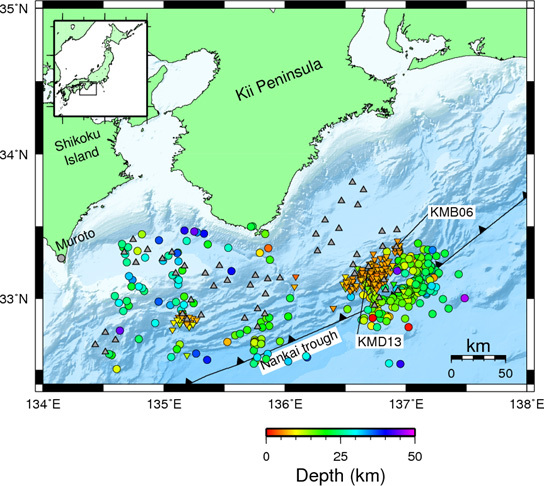 Low-frequency tremors are known to be generated in deep regions along the Nankai Trough (approx. 30 km), compared to the source region of major plate boundary earthquakes, as well as in the shallow regions along the plate boundary, beneath the accretionary prism near the trough axis. *3: Slow earthquakes: A general term for fault slip that occurs more slowly than in standard earthquakes, typified by low-frequency tremors, very-low-frequency earthquakes, and slow slip. Clarifying the generation mechanisms for slow earthquakes is expected to produce a deeper understanding of the generation mechanisms for major earthquakes and of the strain accumulation processes that occur at plate boundaries. As such, this field is being vigorously explored. *4: The Dense Oceanfloor Network System for Earthquakes and Tsunamis (DONET): A system commissioned by Japan’s Ministry of Education, Culture, Sports, Science and Technology and developed by JAMSTEC in order to continuously observe and monitor earthquakes and tsunami generated in the ocean. The network was installed on the deep sea floor in the area of the Nankai Trough and transmits data in real time. The system consists of DONET1, a network of stations on the ocean floor at a depth of 1,900 to 4,400 m in the Kumano-Nada Sea near the Kii Peninsula, and DONET2, a network of stations on the ocean floor at a depth of 1,100 to 3,600 m, and spanning from off Cape Shionomisaki to off Cape Murotomisaki. Each station is equipped with a strong motion seismometer, a broadband seismometer, a quartz water pressure gauge, a differential pressure gauge, a hydrophone, and a precision thermometer. The stations are capable of observing ocean-floor movements from major and minor seismic motions, as well as slow changes, such those occurring in the crust. In April of 2016, with the completion of DONET2, DONET was transferred to the purview of Japan’s National Research Institute for Earth Science and Disaster Resilience, a national research and development agency. The data acquired by DONET is transmitted to the Japan Meteorological Agency in real time, where it is used in earthquake early warnings and tsunami warnings. Figure 1. Signals from regular earthquakes (a and b) and low-frequency tremors (c and d). Observed waveforms (a and c) and running spectra (b and d) from the DONET KMD13 station. Abbreviations: PSD, power spectral density of seismic waves. Figure 2. SRSpec-CNN configuration used in signal differentiation. Running spectral images are created from input seismic waveforms, and the probability of the signal being from a low-frequency tremor, regular earthquake, or noise is output. A pooling layer with an asymmetrical structure (Pool 1, red circle) was newly devised and incorporated in this study. Figure 3. Examples of running spectral images used to differentiate signals. (a) Regular earthquakes, (b) low-frequency tremors, and (c) noise. Each image measures 64 × 64 pixels. The horizontal axis represents time (225 seconds); the vertical axis represents frequency (2 to 10 Hz). Stronger signals are lighter, with white being the strongest. Figure 4. Ternary diagrams used in accuracy reviews and representing the likelihood that each individual event belongs to a given event type, according to the SRSpec-CNN. The closer an event is to a vertex, the more likely it is to belong to the event type to which that vertex corresponds. The differentiation results for input signals from (a) regular earthquakes, (b) low-frequency tremors, or (c) noise. N represents the number of points of event data. The gray shading of each triangle represent the percentages of the total data that are classified as each segment. Figure 5. Distribution of DONET observation stations (gray upward-pointing triangles), regular earthquakes (circles), and low-frequency tremors (downward-pointing triangles) used in this study.